New York City’s Landmarks and Preservation Commission has given Steve Cohen the green light to create an enormous family compound in the heart of Greenwich Village at 145 Perry Street, and the neighbors are not pleased. “I’m really shocked. Perhaps the commission was dazzled by this wealthy client. The plans are impressive and luxurious, but it looks like a Gucci store on Rodeo Drive or a private museum. It is completely inappropriate and out of character for Greenwich Village,” said Andrew Berman, head of the Greenwich Village Society for Historic Preservation. Cohen won permission to build a single-family mansion plus a six story apartment building for his children right next door. But Berman says that the complex resembles a fortress or a “castle with a moat” and not a home in the neighborhood with a welcoming feel. Spokesperson for Cohen, Jonathan Gasthalter, did not comment on the dissatisfaction with Cohen’s plans. There is proposal being considered now by the Landmarks Preservation Commission to expand the area which will be under the protection of the city’s landmarks authority. Under consideration is the area south of Houston Street, west of Sixth Avenue, east of Thompson Street, and north of Watts Street, encompassing 157 buildings. This large area in southern Greenwich Village would extend the two areas which were already approved for protection in 2010 and 2013. If passed, any changes owners wish to make to these landmark buildings will need advanced approval from the city’s Landmarks Protection Commission. The vote to consider the new status took place last week. Anyone wishing to add his or her two cents into the discussion can bring their ideas, displeasure, or support to the committee until November 29. Most of the buildings under consideration for the special status were built prior to World War II. New York City’s Landmarks Preservation Commission decided in a unanimous vote to make south Greenwich Village the South Village Historical District. The 13-block area is New York’s newest addition to the growing number of historic sites, including two which already exist in the West Village and two in the East Village. “This is a long overdue victory for this neighborhood and for anyone who loves New York’s rich immigrant history and long tradition of cultural innovation,” said Andrew Berman, executive director of the Greenwich Village Society for Historic Preservation. The addition of this area to the list of historic sites is the end result of ten years of fighting to win approval for the district. The move will be the largest expansion of landmark protections in the South Village since 1969. Included in the South Village Historic District are 240 buildings with such iconic landmarks as the Café Wha? on MacDougal St, the first venue for Bob Dylan and his unique folk-rock music; and the home of Louisa May Alcott, author of “Little Women.” Caffe Reggio, also on MacDougal is also in the district- the former famous hangout of the “Beat Generation” and the place where cappuccino first made its debut in the United States in 1927. “Few places embody as much history as the South Village, and few places were in as great of danger of losing that history,” Berman said. The status imbued by the Landmarks Preservation Commission disallows demolitions and alterations of buildings within the district without the permission granted by the Commission. The designation also tightly controls new development; completely forbidding the building of structures which are out-of-synch with the stature of the surrounding buildings. High-rises like the 26-floor dormitory building of NYU, which was constructed behind the façade of the historic St. Anne’s Church on East 12th Street would, under the Commission’s present designation, be completely forbidden. 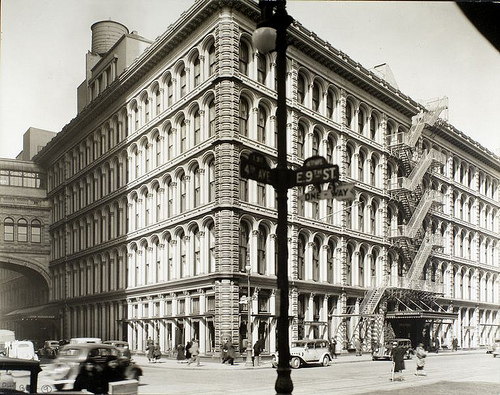 About 330 buildings on the Lower East Side and the East Village have been approved for historic landmark status by the Landmarks Preservation Commission. The designation goes into effect immediately, despite some complaints from a few of the religious institutions in the area. The landmark status will create an historic district that will stretch up Second Avenue between East Second and East Seventh streets. Also included are a few blocks around First Avenue, with a total of about 15 blocks of buildings slated as historic landmarks. 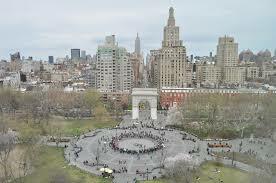 Executive Director Andrew Berman of the Greenwich Village Society for Historic Preservation explained that the designation is necessary if the neighborhood is to maintain its historic flavor. 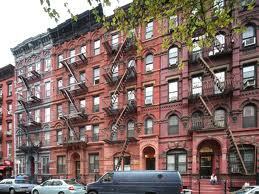 "The East Village is one of New York's oldest and most historic neighborhoods," Berman said. "It's a place that has had an outsized effect on the city's and the nation's history, and it's very much in danger of losing that character due to out of context new development." Not everyone in the neighborhood is happy with the new status, however. The designation will require permission from the LPC before any major renovations or demolitions can be done on the buildings to assure that the changes "do not detract from the special character of the city's landmarks and historic districts," according to the commission. Heads of non-profit and religious organizations with buildings in the historic areas are afraid meeting the requirements of the commission could be costly, burdening these organizations further. Richard Wright of the Cathedral of the Holy Virgin Protection, located on East Second Street between First and Second Avenues is one such neighbor with worries. "We have spent nearly $1 million in the last decade alone conserving our building and for the city to come in and tell us that they can do it better is, quite frankly, an insult," Wright complained. He is also afraid that the designation could lead to gentrification. Berman says that this should not be a concern and that provisions to help non-profits maintain their buildings within the historic status with financial support are built into the law. Grants and financial aid will be made available.